Before you buy a gemstone, check out our Handbook for the Gem Buyer. It covers specific gems, gem evaluation, and what to ask when you go shopping. 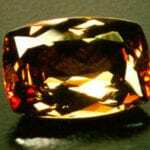 Andalusite is an unusual stone. It shows flashes of several different earth tones in the same stone. Because of its combination of colors, it has been called “poor man’s alexandrite,” but it does not look like alexandrite at all. Andalusite has very strong trichroism; if you examine the green stones carefully, you can see green running in one direction and a reddish brown color in the other direction. The third color, yellow, is difficult to see with out a dicroscope. Andalusite was named after Andalusia, Spain where it was first discovered. Today it is mined in Brazil and Sri Lanka..
At the time of Moses twelve gemstones comprised the Jewish High-Priest’s Breastplate of Aaron; each stone represented one of the twelve tribes of Israel. In ancient India, gems were associated with planets and astrological signs. From these early origins we have derived the idea of “birthstones”. In the first century, A.D., writings indicate a particular stone was to be worn during each astrological sign in order to be harmonious with the ruling planet. Not until the eighteenth century were stones worn as natal amulets. Now this is a great idea if you love your “birthstone”. If you are not happy with the stone currently accepted for your month you can always consult another list and find one that you like. Today’s commercial list includes. Ironically, chrysoberyl varieties include two of the world’s most exotic and expensive gems, alexandrite and cat’s-eye chrysoberyl, while yellow or yellowish-green faceted chrysoberyl is a nondescript variety in the low to moderate price range. Chrysoberyl is a tough and durable gem, which is rare even in its unappreciated faceted variety. Chrysoberyl, unqualified, refers to the yellow to greenish yellow transparent material. In spite of its good qualities, plain old yellow chrysoberyl is overshadowed by the spectacular charm of its siblings. Rubies and sapphires are the same mineral: corundum, with different trace minerals creating a wide variety of color. Rubies and sapphires have been treasured for thousands of years. They were named long before anyone realized they were the same mineral. In this text, rubies include all corundum with a red hue predominant; sapphires include all the corundum of all other hues. Nevertheless a world wide debate rages about the definition of ruby. 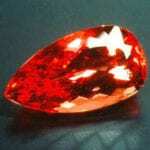 American and European gem dealers contend that “ruby” only included red, not lighter shades such as pink corundum. The Asian dealers argue that. If you are shopping for a large diamond, .75 carat or more, you should look for a loose stone, or ask the stone be removed from the mounting if possible. When it is loose ask to see the stone weighed. Have the seller show you its color grade and show you its flaws under magnification. Look at the diamond in ordinary light, rather than under spot lights. Keep in mind that all diamonds do not look alike, to see the differences it is important to look at a few and compare them. It is especially important to look at them under normal lighting conditions, not just under the intense “diamond lights” that are prevalent in jewelry stores..
Each gemstone species has unique properties; the informed buyer can save time when he knows what is feasible and what is not. Specific prices will not be listed in this book for two reasons: price lists can be very misleading if you do not truly understand the quality of stone described. 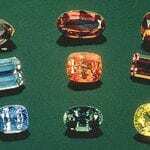 There is no standard shorthand for evaluating the quality of most gemstones and prices can vary significantly with slight nuances in color which are impossible to quantify. The gemstone market can also fluctuate rapidly at times. General price indications will be given in retail prices per. The feldspars are a group of related minerals which, as a group are the most abundant minerals in the earth’s crust. However, only a tiny percentage of the feldspars fall in the “gem quality” range. The members of the feldspar group have similar chemisty, but some have different crystal structures. 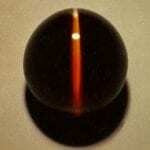 Physical and optical properties are very similar. This book is written as a guideline for the potential buyer of gemstones that are mined from the earth or formed by some natural organic process. As a knowledgeable buyer you will be a confident one. Natural gemstones offer the consumer many choices in all price ranges. This book is not intended as a reference work for gemologist, but as a practical guide for the informed amateur. here are many minerals accepted as gem materials. Some gem materials are organic in origin rather than mineral, such as amber and coral. Here are some additional gems of interest you may encounter on your gem quest. To simplify your pursuit of gemstone knowledge, the varieties discussed in this book will be described in the mineral species. The reason for doing it this way is that each variety of a particular mineral shares common physical and optical properties. To narrow the list to twenty or so minerals to learn about is far simpler than learning about a hundred or so varieties separately. Gemstones may be known by a common name or by a varietal name; some of the names in this list are actually incorrect in a mineralogical or gemological sense, but this list has been compiled to help you find a particular stone you may be interested in. Jade is a confusing term since it is used to refer to two different gem materials. The two jades, jadeite and nephrite, can be somewhat similar in appearance, so the confusion persists. Jadeite was first imported into China in 1784 from Burma. Up to this time the jade used in China was nephrite jade. Jadeite is found in a few places in the world, but the only commercially mined deposit is in Burma. 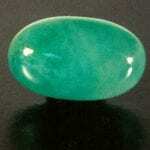 Burmese jade is another name for jadeite. Lapis lazuli differs from other gem materials because it is a “rock” composed of several minerals rather than being a single mineral as the other gemstones are. The components of lapis lazuli include sodalite minerals, calcite, and pyrite. The sodalite minerals are the blue part, the calcite is white, and the pyrite is the “gold flecks” commonly visible in lapis lazuli. The finest quality is a dark, but still intense blue color with no visible calcite and a mere sprinkling of pyrite. “Royal blue” is a descriptive term for fine material. 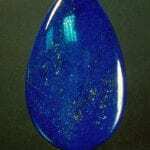 All lapis lazuli is opaque. If there is quite a bit of calcite the material is a lighter blue; this can still be nice as long as there are no visible portions of calcite. As the color becomes lighter the value of lapis lazuli drops, visible calcite is a definite detriment. Quality of cutting is a value consideration also. The first man-made gem materials dates back a few thousand years; early Romans made glass beads and gems. Since natural materials are also in short supply and often hard to mine, man will look for alternatives. Glass gem substitutes are still with us. Glass can be made in any color and it can take on some interesting effects. But glass lacks durability, it breaks easily and is easily scratched. Also a low refractive index means little brilliance. Foil backings and coatings on glass stones increase their brilliance; these are quite easy to spot. The beauty, color, and brilliance of each different gemstone variety is a result of its unique set of physical and optical properties. Gemologists study these properties to identify gemstones and to read where they are from and how they were formed. Many people spend their lives studying this subject but a basic summary is not difficult to learn and can make looking at gemstones more interesting. The beauty of a gem, the distinctive way it handles light, its color are all a result of these properties. Quartz is generally divided into two groups: the transparent crystalline varieties and the translucent to opaque chalcedonies that are microcrystalline forms of quartz. There are many different varieties in these two types but they have one thing in common: they are low in cost. Some are downright cheap! Quartz is one of the most abundant minerals on the earth’s crust. It is also one of the most interesting. The most famous ruby in the world is actually a spinel! 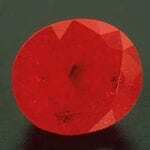 It is the “Prince Edward Ruby” which is the center of attention on British Crown of State: this crudely shaped cabochon weighs about 167 carats. It is a magnificent red color. 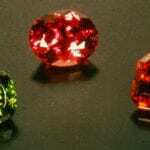 Spinels and rubies are often found in the same gem gravels and for centuries they were thought to be the same gemstone. If you are looking at a tanzanite it is critical to view it under different lighting conditions. 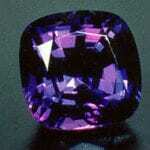 In daylight tanzanite will display the most blue, incandescent light will bring out the violet color. Generally those stones that are brilliant blue with minimal violet, even in incandescent light, will command the highest price. If you prefer the violetish shades you will pay less. The valuation of a gemstone is derived from the “FOUR C’s”: carat, color, clarity, and cut. Understanding all four of these is vital background to the buyer. If you are buying an expensive stone with a price in four figures or more, buy it loose so you can see it weighed and be able to fully examine it. Of course, this will not always be possible; some jewelry is already set, for example, if you were buying a piece of jewelry from an estate or from an auction. 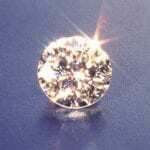 Some gemstones are mounted in a bezel or other setting that would be damaged upon removal. You may never have heard of iolite. It isn’t a household word, but it is an attractive indigo colored gemstone. It has been called a “water sapphire”. 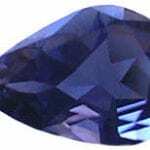 Iolite is highly trichroic; in one direction it is totally colorless, this aspect was the origin of the water description. The “blue denim” gemstone is another deserving description. Iolite has a color with its own personality and deserves to be considered on its own merits rather than as a substitute for sapphires or tanzanites. Iolite is often used in jewelry with other colored gemstones such as amethyst, rhodolite, and pink tourmaline. Aquamarine was the talisman of the sailor for centuries, its colors resemble those of the sea and it has a delicate watery appearance that perfectly suits its name. 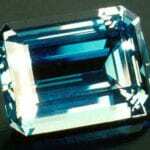 It is the blue-green to green-blue variety of beryl. It ranges from an icy pale blue to a medium dark blue color. Although, even in the darkest shades, its color is always a pastel blue with varying amounts of green as a secondary color. 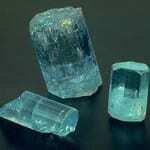 Aquamarine can be found in fairly large sizes. Light colors can be low in price but more saturated blues can be moderate to expensive. Garnets are a group of related minerals which have slight variations in chemistry but a common cubic crystal structure. Many garnets fall in between some varieties and defy assignment to a specific group. When in doubt just call it a garnet. 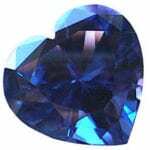 Unless you have your heart set on a blue gemstone, you may want to look at the beauty that garnets offer at a relatively low price. Pearls are organic gem materials form in a variety of mollusks when the mollusk covers an irritant with layers of nacre. 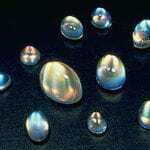 Oysters, mussels, conch, and abalone can produce pearls. 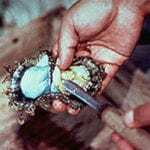 Oysters and mussels can do this job by themselves when an irritant accidentally enters its shell to produce natural pearls or can be aided by man introducing a bead into the mollusk to produce cultured pearls. The most valuable gems come from crystallized minerals that have formed under heat and pressure deep inside the earth. The perfect order of the crystal structure is what makes gemstones transparent yet durable. Crystallization of minerals is a fairly slow process, to enable it to occur, specific geologic and chemical conditions must be met. 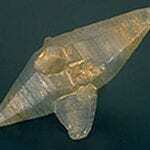 Depending on the conditions, the same chemical recipe will crystallize in different crystal structures. Gemstones have been treasured by humankind since the beginnings of civilization. Every ancient civilization found practical and decorative purposes for gem materials. The durability of gemstones lent itself to practical uses: ancient gemstones were carved and used as seals that acted as the bearer’s signature. Egyptian scarabs are the best known of ancient seals; the Egyptian chief justice wore a lapis lazuli seal engraved with the image of the god Ma which represented “Truth”. Scarabs were also said to have the power to deliver the dead into eternal life. 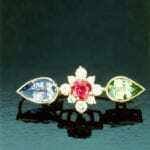 Of course, these gemstone seals were beautiful so they were also worn as talismans to protect and bless the wearer. The crown jewels of many kingdoms were pawned to finance wars of conquest and discovery; the best known was Queen Isabella of Spain who financed Christopher Columbus in his voyages. Fortunately, today everyone can enjoy gemstones. Every opal is unique in appearance. Opals contain fireworks of every possible color dancing inside them. 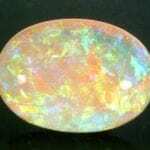 The flashes of color that make opal such an interesting stone are referred to as play of color. Opals will vary in body color, which is the background color of the stone. White body color is most common. The most valued body color is gray to black, with black considered best because it emphasizes and accentuates the play of color. Fire opal is material with yellow, orange, or red body color. In rare cases, opals will have green or blue body colors. Cleopatra was reported to have a fine collection of emerald jewelry, but rumor has it that it was really peridot. We hope she won’t be too disappointed. Peridot was mined on an island in the Red Sea called Zebirget or St. John’s Island, thousands of years ago. These peridot are a magnificent green color and truly deserved a place in royal jewelry. The treatment and enhancement of gemstones has existed for centuries. 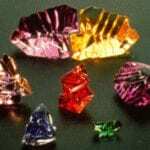 Some enhancements improve on nature slightly, are undetectable, and they are permanent; this provides the gem market with a larger supply of beautiful gemstones. Other treatments produce dramatic changes in the gemstone; the irradiation and heating of colorless topaz that permanently transforms it into blue topaz is an excellent example. 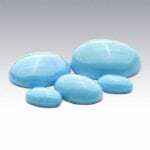 A few treatments are less stable and should be avoided by the knowledgeable buyer..
Topaz is a gem that is very often eye clean, so stones with good clarity are available. The red color can be a strawberry hue: these are quite hard to find and will command the highest price. Deep pinks can be exceptionally beautiful. Pink topaz is mined in Pakistan. Pink stones are also available from Brazil; but most of these stones have been heated from orange material. It will not be easy to find the red and deep pink colors; if the color is intense, expect to pay an expensive price per carat. Pastel pinks are also available. These rarer topaz colors generally are found in stones under ten carat sizes. 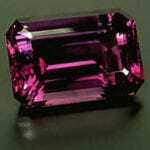 The most common tourmaline colors are greens and pinks. Yellow and violet tourmalines are relatively rare. Tourmaline that falls into the distinctive red colors is called rubellite. Blue colors are called indicolite. 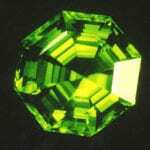 Chrome tourmaline is a green variety that is found in Tanzania: in its best qualities it can resemble fine emeralds. 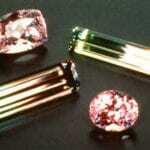 Stones with two or more distinctive colors are called bi-color, tri-color or parti-color tourmaline. If the stone is green with pink in concentric bands it is called watermelon tourmaline. 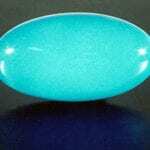 Turquoise has a long history as a gemstone. It was one of the favorites of the ancient Egyptians. Its name was derived from the word “Turkish”, which referred to the ancient source of turquoise in present day Iran. Turquoise will vary in color from pale to medium in any possible combination from sky blue to green. Turquoise may contain visible matrix or webbing. Each source has its favorite color. If you are in Nevada they may charge more for a blue piece with a complex pattern of black lines called spiderweb, in Colorado they may revere the green stuff. The turquoise that commands the highest price per carat on the world market is called Persian turquoise: it is a medium blue color without green secondary colors and has no visible matrix, lines, or other type of flaws in it. At this point fine turquoise is called “Persian quality” meaning it may really come from Arizona but it resembles the fine turquoise that was once mined in Persia, now Iran. Zircons were called “jacinth” or “hyacinth” in older writings. 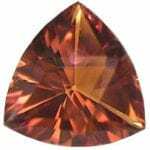 Zircons are exceptionally brilliant gemstones; the high zircon has the highest refractive index of any natural transparent gemstone. High zircons are usually blue or colorless. 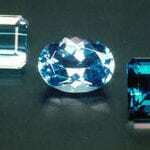 Fine blue zircons are rare, but they are exceptionally beautiful stones.